The magestic, craggy profile of the Langdale Pikes, Wordsworth's 'five solemn pikes of Langdale', are the most distinctive, instantly recognisable of mountains in the Lake District, while the Great and Little Langdale Valleys contain some of the most outstanding scenery Lakeland has to offer. 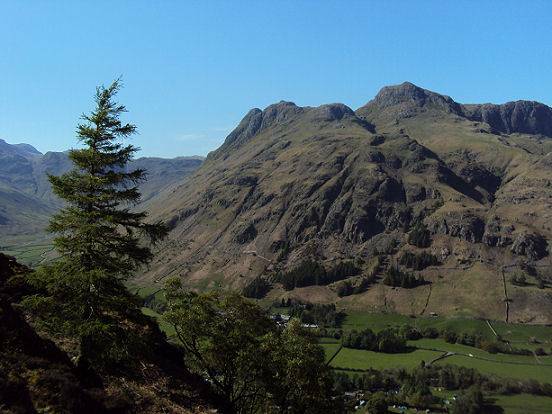 One of the best views of Great Langdale is undoubtedly that from the slopes of Loughrigg Fell. The pikes themselves, once volcanic, from below appear as a sharp rocky ridge, though they are only precipitous on their southern side. 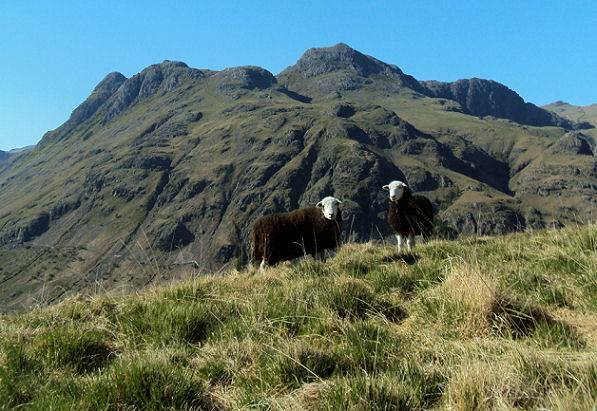 They include (leading from west to east) Pike of Stickle, Harrison Stickle, Loft Crag and Pavey Ark. 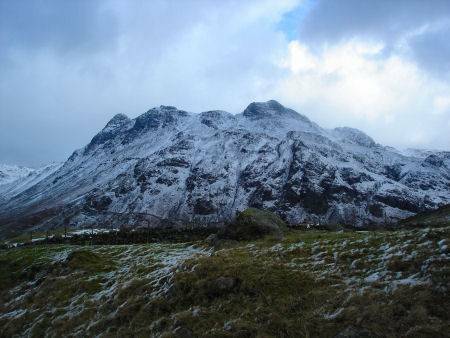 The thimble shaped Pike of Stickle (2323 feet) has one of the most distinctive summits in the Lake District and commands superb views of the surrounding area. 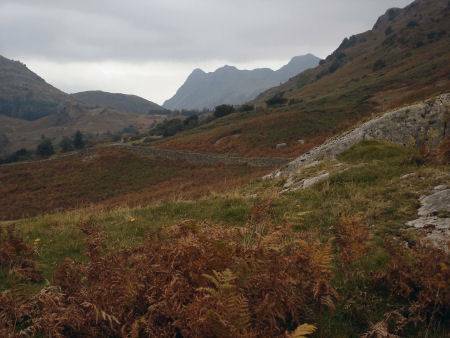 The pikes are visible from a distance of many miles when approaching Lakeland from the south. 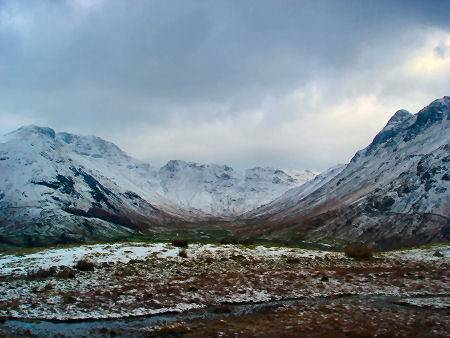 Great Langdale is one of the earliest parts of the region to be occupied by man. 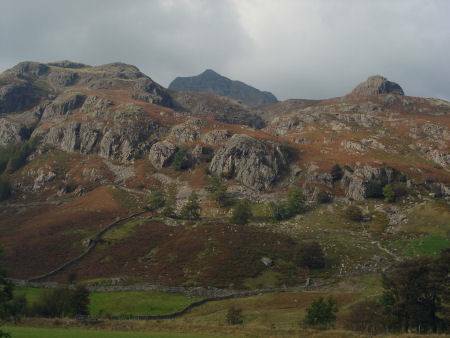 A four thousand year old axe quarry stands on the heights of Pike o' Stickle, located on the scree slope on the steep southern side of the fell. It is one of the most important prehistoric axe factories in Europe. 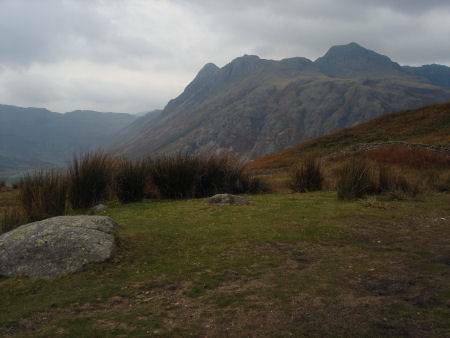 The walk up to Stickle Tarn, from where there are excellent views of Lake Windermere, takes about an hour and although steep can be managed by most walkers. Further down the valley is the dramatic Dungeon Ghyll, a spectacular waterfall set in a deep gorge. On the road through the bleak and austere Hardknott Pass is the remainder of a Roman road that once stretched from Ravenglass to Ambleside, then known as Galava. Situated on the edge of Hardknott Fell is the Roman Fort of Mediobogdum, one of England's finest Roman ruins, built in the reign of the Emperor Hadrian (117-38). Blea Tarn, a panoramic beauty spot lies near to where the Great and Little Langdale valleys meet. Obtain a reliable local weather forecast before you set off and plan a route suitable for forecast conditions. Check your equipment before leaving, take waterproofs, spare warm clothing, hat and gloves. food and drink, a map, a compass and a survival bag. 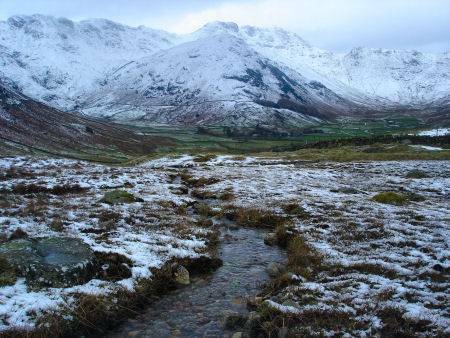 Learn basic mountain skills, particularly navigation.